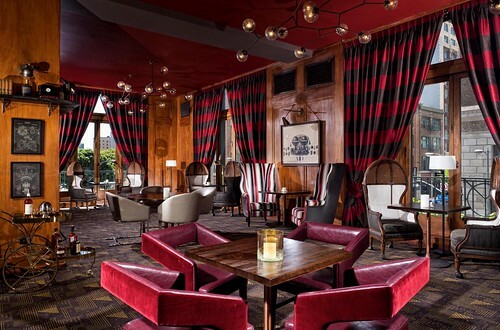 A few weeks ago, I had the privilege of joining Dan of Thirsty in LA, Caroline on Crack and John of Social Domain LA in taste-testing Hemingway’s Lounge Director of Cocktails Alex Straus’ new winter cocktail menu. Alex’s renditions of winter cheer did not disappoint. 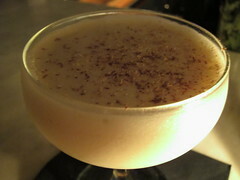 For one, my favorite drink on that menu has to be the Hemingway’s Nog, made with Atlantico Rum, Licor 43, creme fraiche, Tiki bitters, grated nutmeg and love. It’s the perfect adult nog that is extra comforting to your palate yet won’t give you that stomach ache like you got at your grandmother’s after too many glasses. Atlantico, a blend of Dominican Republic small batch rum, is the perfect spirit and the creme fraiche is the perfect substitute for the milk and cream. 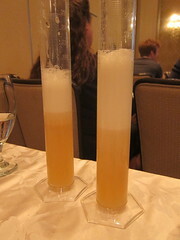 The cocktail is so light yet savory to the froth. If you’re looking for something more aromatic and English, go with the Chamomile-infused Gin Martini, made complete with chamomile-infusedÂ Junipero,Â Dolin Blanc vermouth, Reganâ€™s Orange Bitters and flamed orange. The florals are accentuated nicely by the citrus, making this particular gin martini another one of my favorites on the new menu. Feeling like a hot toddy? The Whiskey Warmer is most excellent. 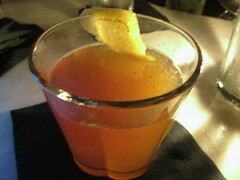 Made with Elijah Craig 12, St. Elizabeth allspice dram, maple syrup, fresh lemon juice, hot water and ground cinnamon, the warm drink takes me from Hollywood to Mammoth in one sip. 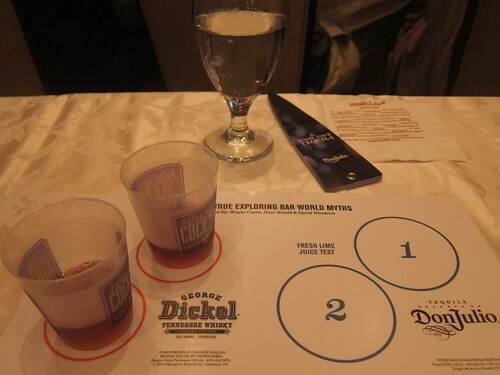 In fact, I believe I’ll be bringing more than my snowboard on my next trip up and will try to re-create this deliciously comforting, soothing cocktail. Speaking of favorites in general, there were so many other cocktails that were superbly made for us – like the Moveable Feast (rye whiskey, sage, berry, honey, lemon and The Bon Vivants Tomahawk Bitters) and an impromptu cocktail with Coruba Dark Rum, Appleton Estate Reserve, Smith & Cross, lemon, lime, pineapple and and St. Vincent’s Orgeat – but I really have to cut to the chase. 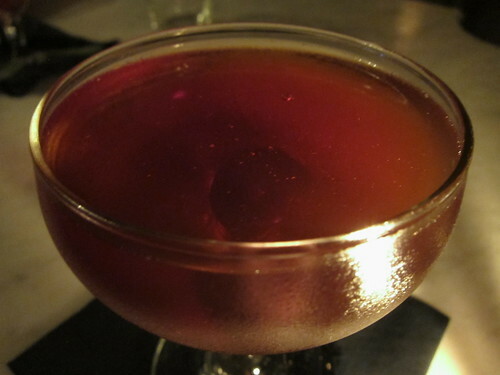 We all had to have a Manhattan, and it was my first time having it made with Whistle Pig Rye. It was incredible, and I’ll leave it at the fact that I have had it 3 times since this tasting. I’d be remiss to omit that Hemingway’s Lounge is a rather unique space to enjoy great cocktails for all the wrong reasons. Okay, here’s one right reason: The interior is beautiful, with books and typewriters lining the walls straight up to the ceilings. Here’s another: Muriel Hemingway expressly gave the bar her blessing to use the family name, giving credence that the bar is an appropriateÂ tribute and not a knock-off.Â And now for the rest: It’s on Hollywood Boulevard, where no drinking establishment is exempt from patrons who willingly line up 5 deep to order “vodka-sodas with a splash of Red Bull” (I personally witnessed this on a Saturday night I was seeking some entertainment in the English language on the day I had flown back in from Taiwan). 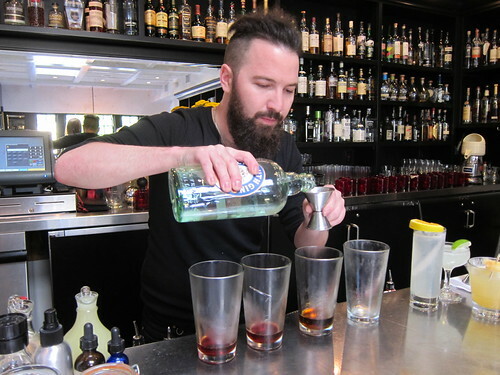 But Alex Straus is a mixologist-bartender who thrives in this industry and environment – even when it’s 10 deep. After all, one’s shaker arms can only take so much. As one who avoids reservations and bars in general on Friday and Saturday nights (amateur hour), I have to say that it is completely worth it to see Alex or one of his guys on the weekday (Tuesdays, Wednesdays) and/or as early in the night as possible. For beer drinkers, Hemingway’s has only taps, no bottles – with a non-Hollywood price point ($5-6), to boot (list). The bar’s soundtrack is solid, with classic rock, funk and even jazzÂ dominating the playlist. Impressive. 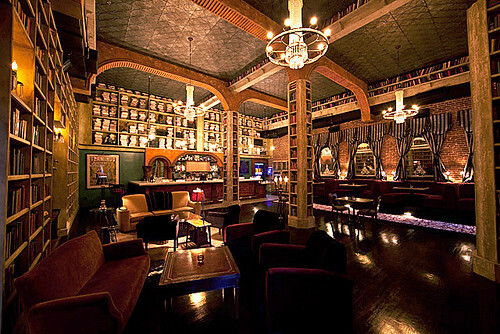 If someone told me that my new favorite neighborhood cocktail bar would be on Hollywood Blvd., I would have scoffed at one point. But for the first time since moving to Hollywood (and luckily walking distance to Hemingway’s), I felt that the people in the 20 foot line outside this bar were sitting on a goldmine – and not just another joint pumping out spicy tuna at 180 BPM. It’s not my fault if they don’t recognize it; save those shaker arms for me, please!